Your holiday dorm room decorations are pretty important for making your college dorm room feel like a home away from home. You may have fond memories of decorating your Christmas tree with your family but may be missing out because of being away. That can be pretty saddening and make you feel even more homesick. However, you can cut back on your homesickness and bring those same fun holiday decorating feelings to your college dorm room by doing some dorm room decorating for the holidays! When you're dorm room decorating with your dorm Christmas tree, one of the most important pieces you want to add to the branches is garland. Garland ties together your holiday decorations on your dorm Christmas tree for a complete look that will make your Christmas tree stand out. Our Orange Garland with Mini Lights has a bright color that will make your holiday dorm room decorations stand out even more! 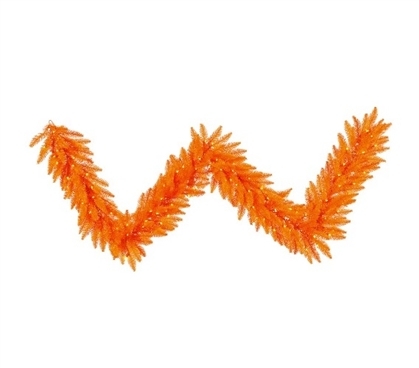 This dorm essentials item has orange mini dorm lights on orange wire wrapped around the garland strand so you have even more bright and cool looking dorm room decorations on your college Christmas tree. You can even place this dorm necessities item around your dorm room on your dorm desk or college bookcase for extra holiday dorm room decor! Love the bright orange color and want to use it other than just at Christmas time? Wrap this around your other dorm items during Halloween for Halloween dorm room decorations!